American toads are a hardy and popular toad species that take readily to life in captivity. Adult American toads average around 4 inches in length, yet require very little space to live comfortably as long as their basic needs for moisture and burrowing room are met. The perfect American toad tank can be set up with minimal effort and almost no complex equipment, making them an excellent species for new hobbyists. A single American toad can be housed comfortably in a standard 10-gallon tank. A good rule of thumb is to add an additional 5 gallons for every additional toad. Tanks should be clean and free from chips or gouges which could harbor bacteria and make cleaning difficult. American toads are known to jump, so a securely fitting lid is also a must for any toad enclosure. 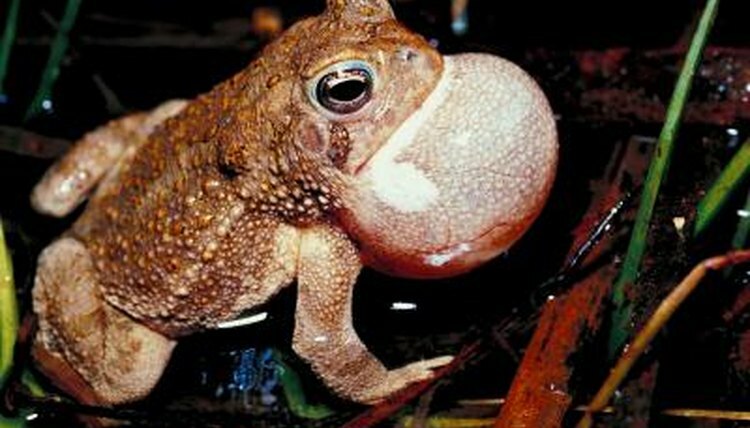 American toads are nocturnal, and spend much of their day burrowed beneath the surface of the earth. Their need to dig makes choosing an appropriate substrate especially important. Look for substrates that are relatively soft and free from sharp edges, and choose natural materials over man-made ones, which can cause gastrointestinal problems if your toad ingests some accidentally. Coconut fiber, organic soil, peat moss or cypress mulch are all safe options, though some experimentation may find your toad has a preference for one type of substrate over the other. Avoid fertilized soils or mosses, as these can be toxic for your pet. The substrate should be at least as deep as the toad is long to allow room for digging. A perfect tank for an American toad should be kept between 60 and 70 degrees Fahrenheit, about the average indoor house temperature. Because these toads are nocturnal, UV lighting is not generally considered as imperative to their digestive process as it is with most reptiles, but a stable day and night schedule can make your toad much more comfortable in his tank. A simple light timer can be connected to the tank lights to maintain a 12-hour daylight schedule. You may leave a red-spectrum bulb on overnight for observation of your toad during his waking hours, which will not interfere with his habits. The American toad’s tank should include a shallow dish of water for the toad to soak in. This dish should not be so deep that the toad can drown, and should include a means of easily exiting and entering the water, such as a rock or piece of bark. In addition, mist the toad’s substrate two or three times per day, or enough to keep it damp (but not soggy). American toads are very sensitive to toxins in their water, so any water used in the toad’s tank should first be dechlorinated with a commercially available water treatment product made for fish or reptiles. Alternately, you can use bottled water, as long as it is not distilled. American toads are not fussy about decorations, but to truly create the perfect tank for a pet American toad, provide at least a handful of hiding spaces, such as rocks, bark pieces, branches or small potted plants. These will provide your toad with safe places to escape during the day, in addition to making a more realistic atmosphere for your toad to call home.